John Lennon and George Harrison in studio, recording Lennon's "How Do You Sleep?" Pictured from left to right: Klaus Voormann, George Harrison, John Lennon, and Yoko Ono. This previously unseen video, which includes the raw studio mix of the audio, completely unadorned, comes ahead of the Oct. 5 release of a 6-CD box set, Imagine - The Ultimate Collection. John Lennon's second solo album, Imagine, was released in Sep. 1971, just about two years after The Beatles went their separate ways. John Lennon said that this song was a response to lyrics on Paul McCartney's own solo album, Ram, that Lennon felt were directed at him. (Give a listen to "Too Many People" and "Back Seat of My Car" and you'll hear what Lennon was referring to.) 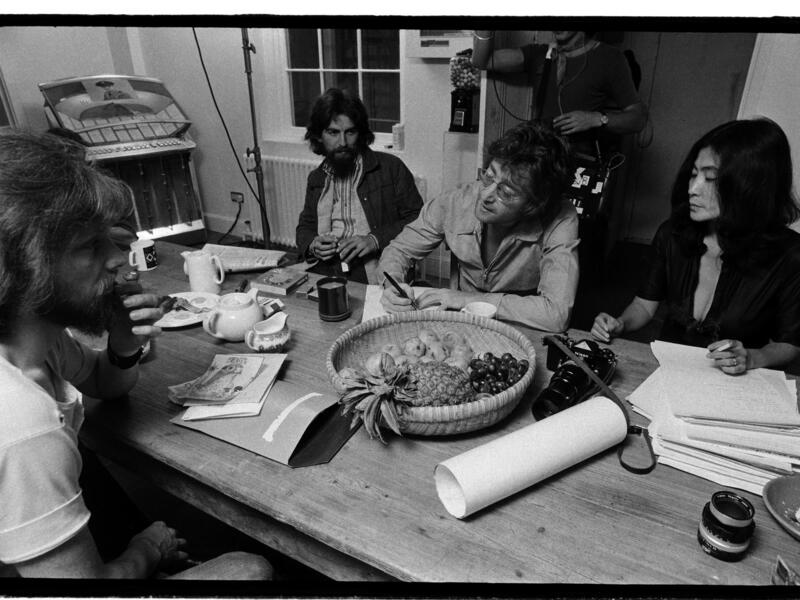 Yoko Ono, who sat in on and co-produced these recording sessions, wrote to us to say that "John wrote many great songs, some tender and some mean... ... people thought this was about Paul, and Paul seems to have thought that too, so too bad it wasn't played too much." The 120-page book included with the box set contains this from John Lennon: "If I can't have a fight with my best friend I don't know who I can have a fight with. I think it's quite funny and I was laughing when we were making it and listening to it. I was laughing at his later, but first I was saying, 'Oh, I see, that's what he thinks,' huffing and puffing." For me what is so striking about this recording is its starkness. Here you have John, sans the voice doubling he loved so much, none of the Phil Spector strings that shaped much of the character of the release we all came to know in 1971. What you do have on "How Do You Sleep? (takes 5 & 6)" is a brilliant slide guitar performance from the former Beatle George Harrison, the relaxed bass of Klaus Voormann, Alan White on drums, and Nicky Hopkins on Wurlitzer electric piano. John called George's playing "his best guitar solo to date on this cut, as good as anything I've heard from anyone, anywhere." 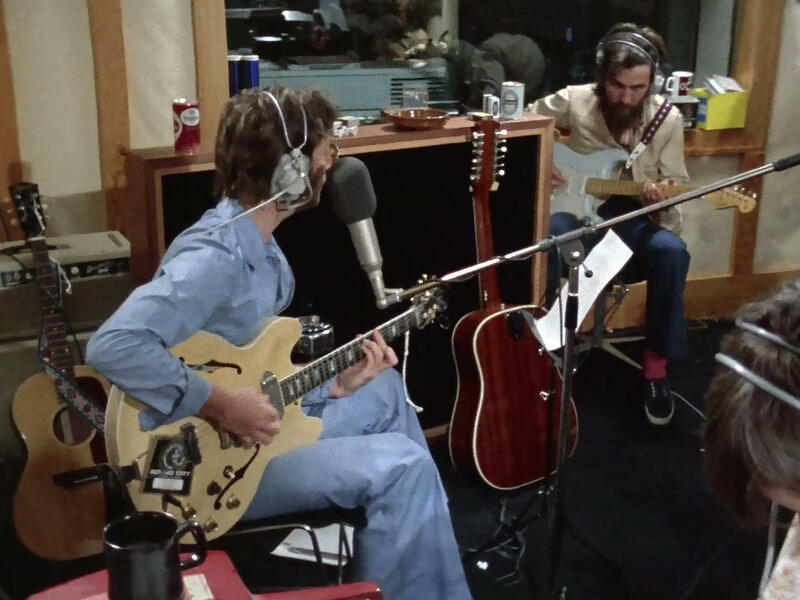 The recording was made at Ascot Sound Studios, a studio built by John Lennon and Yoko Ono in 1970, on the grounds of Tittenhurst Park in the English county of Berkshire. The Imagine box set also includes a 140-track collection, remixed and remastered, including a 5.1 surround sound mix. Engineer Rob Stevens wrote to NPR to say, "Our approach, meaning Yoko and myself, was to make the listening experience as if one had the exceptional privilege of sitting in the middle of the studio with the players either around them (the 5.1 surrounds) or in front of them (the stereos), without any of the effects or sweetening (strings, chamber echo, tape slap, etc.) that were subsequently added. We had a hunch that the initial performances stood on their own, even though at the time the sweetening clearly helped the record reach the heights that it did and continues to do."